Attention Marvel fans! Your favorite stars from Marvel Television are taking over San Diego Comic-Con. Join us for must-see panels featuring first look footage, exclusive signing events and an inside look into the world of Marvel. The fun kicks off Thursday, July 21, with the first-ever San Diego Comic-Con Marvel and Netflix panel session. Moderated by Jeph Loeb (Marvel's Head of Television and Executive Producer), The Netflix Original Series: Marvel's Luke Cage panel will feature the first ever appearance of the star-studded cast including fan-favorite Mike Colter (Luke Cage), Alfre Woodard, Mahershala Ali, Theo Rossi, Simone Missick, Frank Whaley, and showrunner and Executive Producer, Cheo Hodari Coker. This panel promises to deliver exclusive updates on the latest Marvel Television and Netflix series that fans won't want to miss. Follow @lukecage on Twitter and #lukecage for the latest. Then, on Friday, July 22, join us for the Marvel Television Presents: Marvel's Agents of S.H.I.E.L.D. 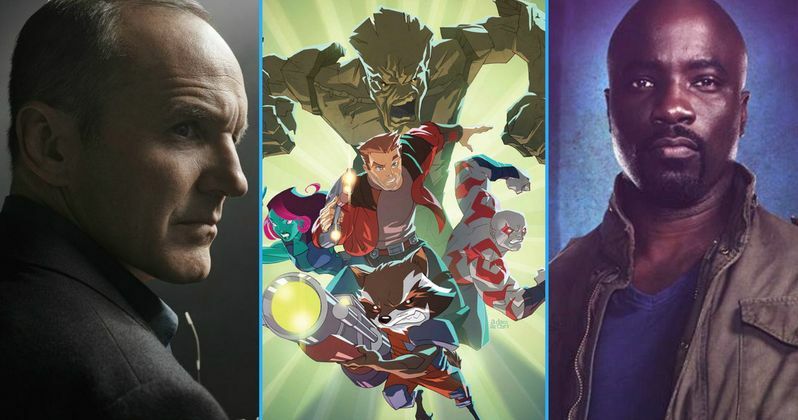 panel where Jeph Loeb (Marvel's Head of Television and Executive Producer), the showrunners, and cast will bring fans the latest news and a few surprises about Season 4 of the hit series! On Saturday July 23, you won't want to miss the Marvel Animation Presents panel with Cort Lane (SVP, Animation and Family Entertainment,) Eric Radomski (SVP, Production and Creative Director - Marvel Animation) and Stephen Wacker (VP, Current Series & Development - Marvel Animation Studios), as they debut exclusive sneak peeks from upcoming episodes, share scoop on exciting new projects in development and bring along some special guests that have secretly RSVP'd! You'll also have a chance to meet the stars of your favorite Marvel Television series and get an exclusive poster at signing events at the Marvel booth (#2329) throughout the weekend. The Marvel Television schedule kicks off on Thursday, July 21 with a Marvel's Luke Cage Signing Event at 3:15 PM at the Marvel Booth (#2329). Stars Mike Colter, Alfre Woodward, Mahershala Ali, Theo Rossi, Frank Whaley, Simone Missick, Cheo Hodari Coker (EP) and Jeph Loeb (EP) will be present. The stars and producers will then hold a panel session from 5:45 PM to 6:45 PM in Ballroom 20. It isn't known if new footage from the series will be shown, but it seems likely. Marvel's Friday schedule kicks off with an Agents of S.H.I.E.L.D. panel session from 3:00 PM - 4:00 PM in Ballroom 20. The panel will be followed by a signing event at 4:30 PM at the Marvel Booth (#2329). Cast members who will be in attendance include Clark Gregg, Chloe Bennet, Ming-Na Wen, Elizabeth Henstridge, Iain de Caestecker, Henry Simmons, Jed Whedon (EP), Maurissa Tancharoen (EP), Jeff Bell (EP) and Jeph Loeb (EP). On Saturday, July 23, Marvel Animation will hold a panel session from 12:30 PM - 1:30 PM in Room 6A, bringing fans behind-the-scenes into the world of Marvel Animation! No panel members have been confirmed at this time. Please note that both signings are ticketed events and passes will be available on a first-come, first-served lottery basis beginning at 9:30 AM on Thursday, July 21 at Marvel Booth (#2329). Stay tuned to www.marvel.com for all the breaking news from Marvel Television at Comic Con International in San Diego. Follow @Marvel on Twitter and "like" Marvel on Facebook for minute-by-minute updates on all things in the MCU. Join the conversation using #MarvelSDCC.